We’re used to [Sprite_TM] rolling out his own hacks hot on the heels of new concepts. Now we’re glad to see that [Jeff Ledger] is doing the same thing here. He was inspired by a Kickstarter project which vows to let you use fruit, clay, and a number of other common (but weird for this use) substances to interface with electronic projects. The mess you see above is the Bananaphone, a synthesizer played with touch sensitive bananas. Think of them as keys on a piano. The interface works by measuring R/C decay. 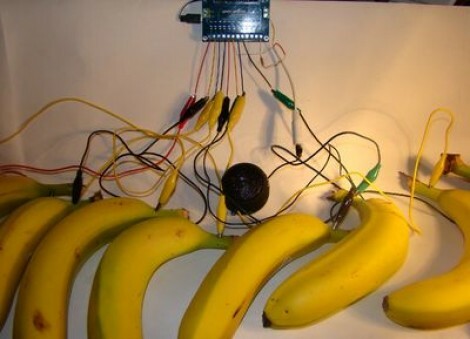 Each banana is connected to its own input pin on the Propeller board. The capacitance of the bananas rise when you touch them, and this results in a longer R/C decay measurement. Calibrate the target decay period, and you’ve got a reliable capacitive touch sensor which also happens to be delicious. Check out the results which [Jeff] achieves in the video after the break. hmm, wonder if this was inspired by the makey makey on kickstarter much? Could this be made with arduino ? Now play banana phone on it. I’m NOT touching THE BANANA. Come on just touch it. Man, you can drag money out of Kickstarter for almost anything it seems. Anything good that’s well fleshed out with good credentials and a solid product (and sometimes plan for a product) stands a reasonable chance. Maybe. Sometimes. You don’t hear about the failures though. So what is the equivalent circuit of a banana? I’m sure there’s a use for this… I just don’t know what it could be. What symbol do I use for a banana when drawing a circuit diagram? Oh, I saw this at maker faire yesterday!